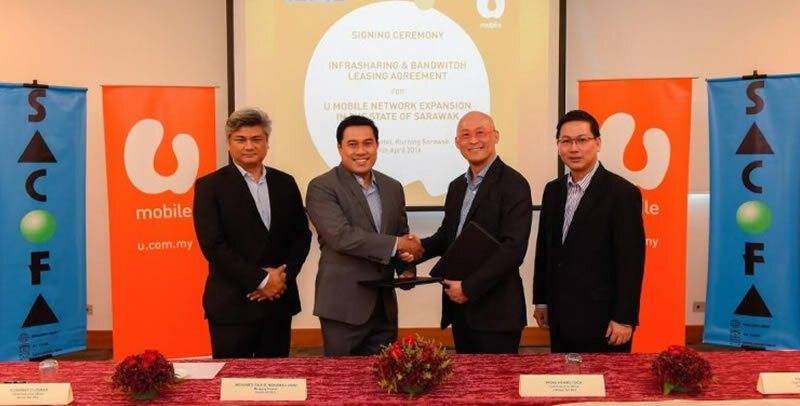 Users of U Mobile in Sarawak can expect better network coverage soon after the telco famed with the colour orange signed an agreement with SACOFA, which is the company in charge of all telecommunication infrastructure in the state. The deal which spans 10 years would see U Mobile utilize some 700 sites under SACOFA which includes some 4,000km of on-land fibre network that goes from Kuching to Lawas. It is understood that the deal with SACOFA will allow U Mobile to offer 4G LTE services in Sarawak, while at the same time expediting the roll out and expansion of U Mobile’s coverage in the state. SACOFA which is owned by the Sarawak government has an exclusive deal of 20-years to build, own and manage all telecommunication infrastructure in Sarawak, in which all companies intending to set up such facilities will need to get involved with SACOFA. While it is not yet known when U Mobile customer can expect to enjoy the better coverage Sarawak-wide, U Mobile’s Chief Executive Officer, Wong Heang Tuck has mentioned that the company is looking at switching their frequencies to the new 1800MHz and 900MHz frequency spectrum from January 2017. Currently, coverage of U Mobile is limited in Sarawak with the telco offering its 2G and 3G service in Sarawak via the Maxis mobile network.